A group of some 28 members of Marple Local History Society visited the disused Manchester Mayfield Station on Friday afternoon, February 22nd led by Blue Badge Guide, Jonathan Schofield. He explained that it had been built in 1910 by the London and North Western Railway Company alongside London Road, now Piccadilly Station to relieve the extra pressure on the existing London Road platforms caused by the opening of the Styal Line in 1909. 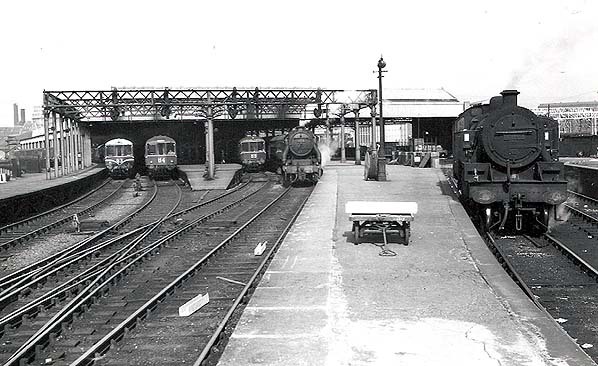 Mayfield Station was connected to London Road Station by an overhead footbridge. By chance I met MLHS member Pat Butler one summer’s day in Market Street. She went into raptures about the beautiful Arts and Crafts church of St Wilfrid, Halton, Leeds which she discovered when she came on the Society visit in May, and she suggested we carry on the Arts and Crafts theme with an autumn visit to Leek. Leek had a market in medieval times, but it began to flourish in the late 18th Century as a centre for the production of silk textiles. In the late 19th century the notable designer, William Morris, worked with Sir Thomas Wardle, the leading silk manufacturer of the day, in developing natural silk dyeing techniques. Morris’s architect and designer friends were attracted to the town and it became a focus for Arts and Crafts Movement architecture. The Society last visited Leek in 2002, so it was about time for a return. We started at Richard Norman Shaw’s All Saints Church of 1885. From the outside All Saints is a rather austere but imposing building. It is Grade 1 listed, and the architect Richard Norman Shaw declared it to be his best church.